SAMUT PRAKAN: Twelve live dogs and two cats were found stuffed in fertiliser sacks on the back of a parked pickup truck in Muang district of Samut Prakan in the early hours of today (May 30). Police and rescuers were called to the entrance of Klang Muang housing estate in tambon Dan Samrong about 1am. There they found 10 sacks left in the back of a pickup parked near a wastewater treatment pond, said Lt Col Uthit Sudjai, investigation chief at Samrong Nua Police Station. The sacks were tightly tied shut, with the cries of dogs and cats coming intermittently from them. 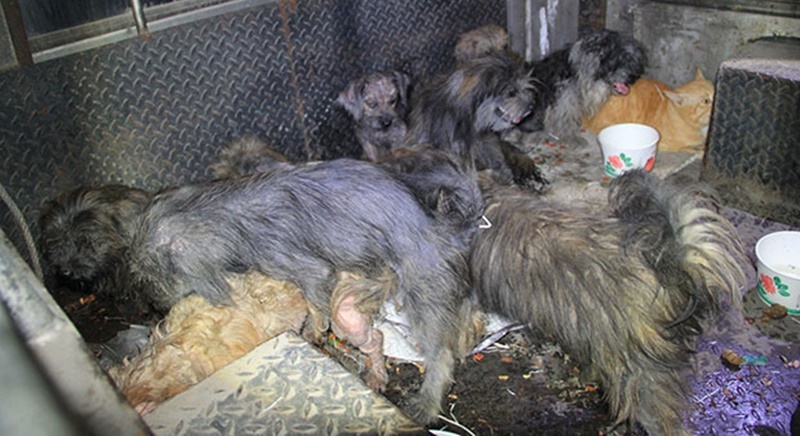 When they were opened rescuers found 12 poodles and two cats inside the sacks. The animals were exhausted and weak. Onlookers quickly brought water, milk and food for the rescued animals. Pathipan Thaiyakorn, 22, who found the animals, said he went to see a friend at the housing estate and parked his car near the parked truck around 5pm yesterday (May 29). He heard animal noises at the time but assumed they were coming from an area behind the wastewater facility. He paid it no attention and went to visit his friend. When he returned to his vehicle late yesterday night he again heard the cries of dogs and cats in distress and started looking around to see where it came from. He quickly tracked it down. The cries were emanating from closed sacks on the back of the parked pickup. He immediately called police. Rescuers took the 14 distressed animals to a temporary shelter in Samut Prakan. A foundation in Chonburi reportedly plans to take them under its care. Police said the pickup might have nothing to do with the animals. According to local residents it had been parked there for a long time. Someone might have dumped the sacks with the animals onto the parked vehicle and left. Investigators were viewing recordings from security cameras to find out when the animals were dumped, and by whom. Whoever was responsible would face legal action under the Prevention of Cruelty and Animal Welfare Act. Poor animals, for them yesterday was not Vasakha Bucha day.